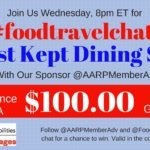 AARP Food And Travel Discounts - Ambassadors of World Food Tourism. If you love food and travel, you gotta love discounts. We all like to save money and stretch our budgets. 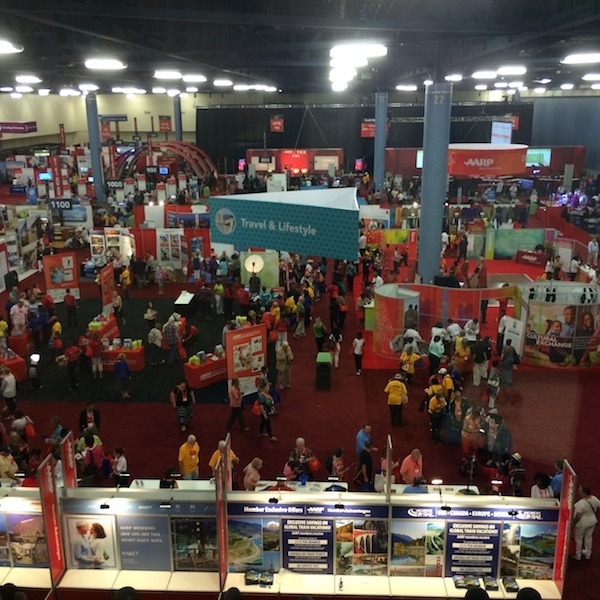 I recently went to the AARP Life At 50+ National Event in Miami and learned all about their benefits and discounts. If you’re over 50 you are eligible for an AARP card. This card does not mean you’re old. This card helps provide opportunities and information that just might help you imagine your food+travel dreams. Plus your spouse or partner gets a free membership! 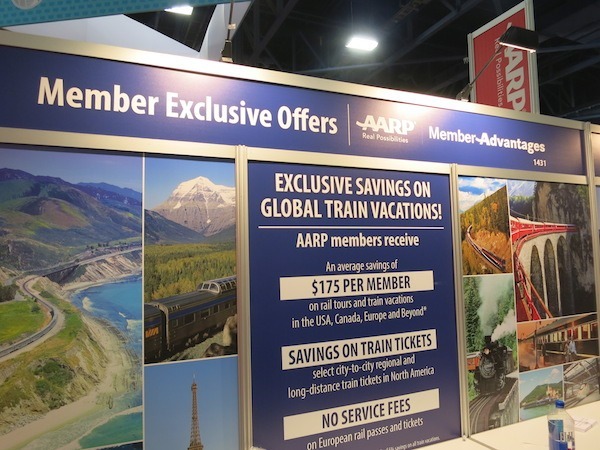 Special AARP Offers by Vacations by Rail. 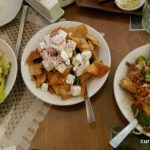 Norwegian Cruise Lines With their new Whatever, Whenever, Whoever dining program Norwegian lets you decide when and what you want to eat with a group or on your own. Save 5% with your AARP card. 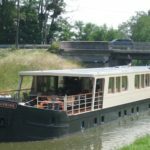 Vacations by Rail Offers hundreds of railroad vacations in the United States, Canada, Europe and Beyond! Whether you’re looking to explore the National Parks of the U.S. or visit Vienna, Prague and Budapest, Vacations by Rail can build a vacation for you. Save 5% with your AARP card. G Adventures The world’s largest independent adventure travel company. They bring curious travelers together to learn, share and explore. Their mantra is, “We love changing people’s lives.” What’s better than that? Plus we love companies that help others. G Adventures recently worked with Planaterra raising money for the Nepal Earthquake Appeal. Save up to $100 per person with your AARP card. Grand European Travel Professional tour guides make your travels smooth and extra special. Save $100 off guided vacations with your AARP card. Hilton This includes all the Hilton brands: Hilton, Waldorf Astoria, Conrad, Canopy, CURIO, DoubleTree, Embassy Suites, Hilton Garden Inn, Hampton, Homewood Suites, Home2 Suites by Hilton, Hilton Grand Vacations and the Hilton HHonors program. Over 4,300 hotels in 2,00o cities worldwide. Save up to 10% with you AARP card. Hyatt Hotels Including Andaz, Hyatt House, Hyatt Place, Hyatt Regency, Grand Hyatt Hyatt Centric, Park Hyatt, Hyatt Residence Club and more. Save up to 10% off with your AARP card. Best Western Save 10% and earn 10% bonus points with your AARP card. Choice Hotels Including Ascend Hotel Collection, Cambria, Comfort Inn, Comfort Suites, Sleep Inn, Quality, Clarion, MainStay Suites, Suburban, Econologde and Rodeway Inn. Save up to 10% off with your AARP card. Starwood Resorts Including W Hotels, Sheraton, St. Regis, Element and more. Save 5-15% off with your AARP card. Wyndham Hotels and Resorts Including Wyndham Grand Hotels and Resorts, Wyndham Garden Hotels, Hasthorn Suites by Wyndham, Dream Hotels, Ramada Worldwide, Baymont Inn & Suites, Days Inn, Super 8, Howard Johnson, Travelodge, Tryp and Knights Inn and more. Save up to 20% off with your AARP card. Yosemite National Park Lodging 10% off with your AARP card at select lodging at the The Ahwahnee, Yosemite Lodge at the Falls, Tents at Curry Village, and for all room types at Wawona Hotel. Avis and Budget rent-a-car offers 10-25% savings all all vehicles with your AARP card. Plus FREE upgrade on compact through full-size class bookings and one additional driver fee waived. Windstar Cruises Save 5% on cruises plus 10% off at onboard stores with your AARP card. Zipcar Need a car for a quick trip around town or while you’re traveling? Save 33% off a Zipcar membership with your AARP card. TEEOFF.com I just discovered this site through AARP. Save 15% off your next tee time. They also offer DEAL TIMES that are even bigger savings if you have some flexibility on when you want to play. Fore! The Oceanaire, McCormick & Schmick’s, Landry’s, Chart House Save 10% off every day with your AARP card. Denny’s 15% off your entire check all day, every day with your AARP card. Outback Steakhouse Save 15% off lunch and dinner every day with your AARP card. Claim Jumper Save 10% off every day with your AARP card. Dunkin’ Donuts get a donut with purchase of any large or extra large beverage with your AARP card. Papa John’s Pizza 25% off regular menu price on all orders with your AARP card. What are you waiting for go to AARP.org and sign up today. Discounts and deals are just a few of the savings available with your AARP card. Offers change and are updated frequently. Be sure to check AARP.org for all the latest details. 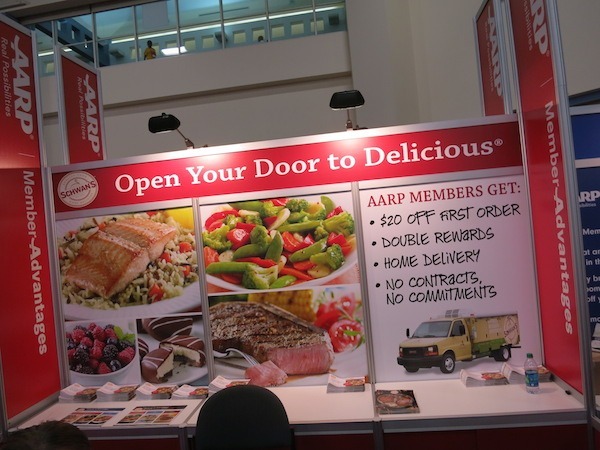 QUICK BITE: If you’re over 50 and looking for some ways to save money on food and travel get an AARP membership for only $16.00 and start taking advantage of the savings today! Good information! Thanks for gathering and sharing! All those benefits & discounts for just $16?? What a great bargain! Some great resources here. Nice collection for travelers. I am 26 years from this applying to me. I find it unfair why should you get special discounts because you are old. Being old isn’t an accomplishment other than not managing to kill yourself doing something stupid before than. Interesting perspective Jennifer. If you look around there’s other avenues for food & travel discounts. I’d suggest looking at the credit cards in your wallet and maximizing the points for rewards. Thanks for stopping by. Great info! Guess I’ll be paying the $16 when I move back to the U.S.! Didn’t realize there were so many discounts! Oooh, this is a helpful compilation of discounts for food and travel! Thanks for listing it all 😀 I’ll definitely bookmark this for future reference. Really helpful! Good to know. I was wondering what membership benefits were. Thanks. 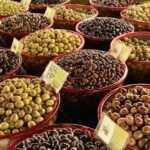 I had no idea that there were all these money-saving options out there! I’m not at 50 yet but will definitely remember this for when I hit the big 5 – 0. I love a travel deal! Who does not love discounts indeed. Thanks for sharing.